I recently read an excellent book about a women with Alzheimer's disease. This novel hit me on so many levels, first because I have worked in nursing homes with Alzheimer's units for several years and seen this terrible disease manifest, and second because I have a dear friend who's mother has early onset Alzheimer's disease. After reading this, I wanted everyone, especially those I work with to read it too. I wrote the following book review that was distributed at my work and published in a local paper. 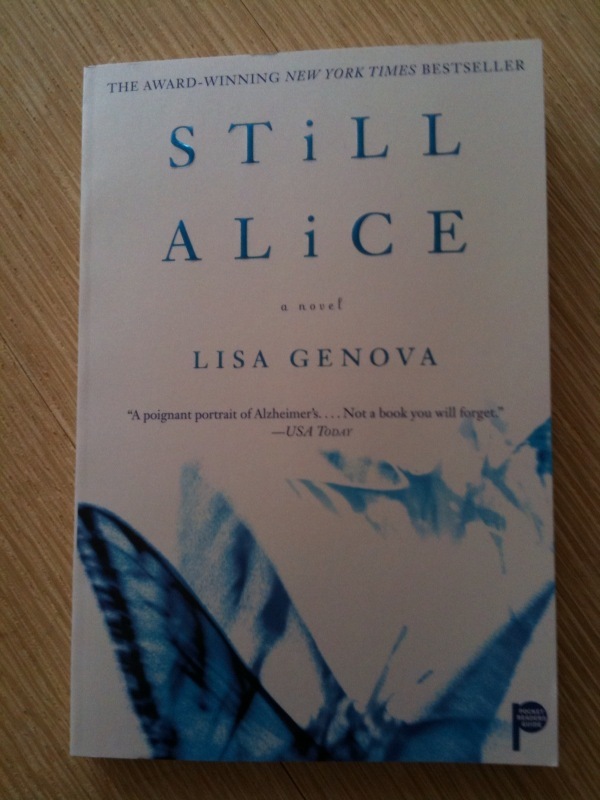 The novel Still Alice by Lisa Genova was real and was profound. It was so real that it both haunted me and made me grateful. The New York Times Bestseller is a novel chronicling a well-educated women with early-onset Alzheimer's Disease and it illustrates so touchingly how it might feel to be her. For anyone who has been touched by this disease, or like me who works with many adults afflicted by this disease, this is a must-read. Originally inspired by her grandmother's trial with Alzheimer's, the doctorate level Neuroscience trained author embarked on a journey into the mind of amyloid plaques and killed off neurons. Alice Howland, the main character, was a professor at Harvard who prided herself on her renowned research, sought after ease with speaking at world-wide conferences, and inspiring daily lectures at the University. When she began to find that she was at a loss for the correct word to complete her thoughts in regular conversation, or that she had forgotten to return an important email, she wondered what might be plaguing her mind so unusually. Early on in the novel, Dr. Howland went for her daily run through her stomping ground of Harvard Yard and she became anxious and confused. After years of habitual, effortless strides, she did not know which direction would lead her home. This frightful experience that seemed to have no logical excuse brought her to seek the wisdom of her physician. And this visit unleashed the cascade of questioning that led to her diagnosis of exclusion... Alzheimer's. When reading this novel, I felt so deeply for the character, for her humiliation, simplicity, and her innocence with uncertainty.I felt scared for my self and for my loved ones. When reading this novel, each line ran into the next, disease progression continued, and my eyes and mind bore into the life of Alice Howland. A diagnosis of early onset Alzheimer's disease is terrifying and terminal, and when Alice was diagnosed in a place of sound mind, she was left with the picture of her future. Should she set up a ritualistic quiz for herself so as to monitor her cognition? And with these answers, make a decision about her life when it comes to a point when it is no longer a pleasure to live? Should she tell her family about the genetic relationship of the disease that may possibly affect her children? When will she stop recognizing her husband? Amazingly, each and every line of the praise and comments touted on the covers and pages of the book mimic my full-bodied enthusiasm for sharing with everyone and anyone. These pages will not leave you untouched. This is a quick read for the compassionate, an informative journey for the inquisitive and a mindset changing story for the helpless, heartfelt reader who will only benefit from this new perspective of awareness that only Still Alice can deliver.